In osier fields (in Dutch “grienden” or twig gardens) you insert cuttings close together in the soil, so that each erase long and grows straight up to the light. Keep 40 cm distance between rows and 10 to 15 cm between cuttings. The 1st year the shoots are crooked and of poor quality. After leaf fall in early winter (December), you pick the one-year twigs. Let your harvested twigs dry with the peel on, then you have ‘brut work’. Wood with bark is easier susceptible to insect attack than peeled wood. If you want to peel the twig you can cook them first. Dry shoots must cook longer. The wood color is than brown. 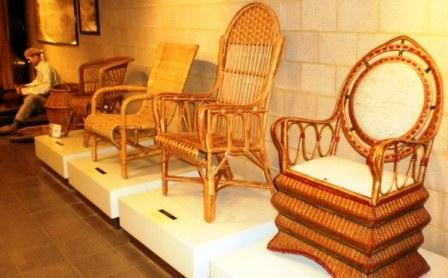 These are buff wicker. You can also set the twigs a winter with their feet in water. They go shoot in spring, leaves and roots are formed. In May-June, when the sap is well underway, the hull is fairly loose. This is the time to remove them. You will then have white twigs. White wicker is more durable because nutrients were washed and were token by the leaves. White material is food poorer and therefore less attractive to insects and fungi. You can also peel directly from the bush, but it is less durable. You can also cleave or cut twigs to size. To avoid mold they should be dried long and well (months) in the wind. Best in a dark place to prevent fading and darker wood. Resting a few years makes the peeled twigs better and harder. Brut twigs should, depending on the thickness, the type and the temperature soak 7 to 20 days in water in order to plait them smoothly in a few days. Peeled twigs have enough with a few hours water. They are best soaked in the evening and overnight laid covered in grass or dew. They also dry out fast. Unlike brut, white twigs can be soaked a few times. 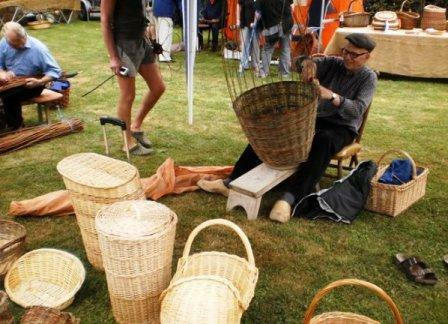 To braid a round basket you put 3 twigs on the ground. In the middle, transversely crossing there, again 3. By weaving a single twig some times over one and under the other beam you connect this cross. Thenyou spread each bundle of 3 open and weave alternately over and under each sprig around until you find the base large enough. For the upright side you tuck up the stakes. If the distance between the stakes is too wide, you insert a new one between them. Also if the basket should be taller than the stake you should in time interweave a new alongside the existing one. The upper border can be reinforced by braiding the stakes with twigs around the edge. You can save or braid handles. You can get a pattern in the braid by braiding with two twigs instead of one, and / or bypassing 2 stakes instead of one. I find it easier to work with an odd number of stakes. Then, inside and outside of a stake change automatically after each round. For an even number, start braiding with 2 twigs together, facing each other. A transition you make just by the thin end of a twig a few turns to coincide with the thick end of the next. Want a rectangular bottom, then you put twigs parallel on the ground and weave between them. You can create patterns by braiding by 2 or 3 twigs or skipping railings. With twisted twigs you can make a birdcage: two twigs are always together, same time, front and rear crossing a bar. Between each tour you can let (up to 15) centimeters open. Also suitable for (open) laundry baskets. If you have thicker branches and / or shorter bends to braids (e.g. garden panels with final bend of 180°) you can reduce fractures by not only bending the (wet) branch, but also twist it around its own axis, causing tearing fibers keeping each other somewhat together and in place. 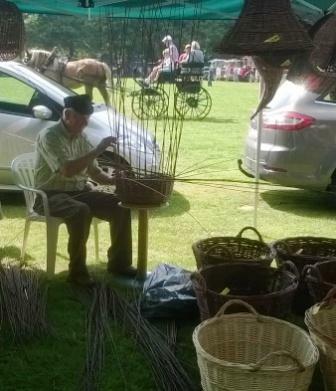 If you use an inverted basket as a basic idea, you can also braid twigs to comfortable chairs. All flexible shoots are used as a braid material also alder (Alnus), maple (Acer pseudoplatanus), hazel (Corylus), holly (Ilex), elm (Ulmus), dogwood (Cornus Alba), lime (Tilia), plum (Prunus), blackthorn (Prunus spinoza), snowberry (Symphoricarpos albus), sweet chestnut (Castanea sativa). Or climbers as woodbine, honeysuckle (cooked and peeled), hops, vines, flax, grasses, (elm) bark.